It feels like they'll never stop coming. 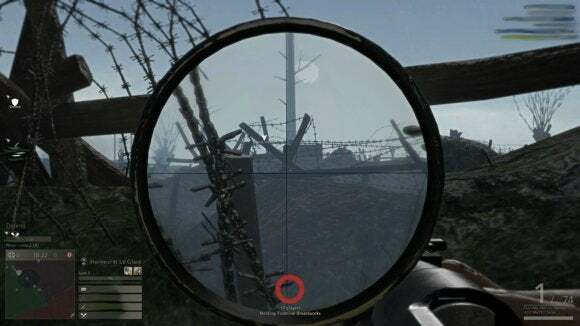 Through my rifle's oversized scope I watch German after German bob and weave across the battlefield, their spiked helmets popping up for mere instants before sinking back down into another crater, edging ever closer to our trench. I pick off one, two, three, and then artillery fire is raining down to my left, massive plumes of dirt erupting into the air from our front lines. The Germans swarm into the breach, shouting. A whistle blows off to my right, a man waving his pistol into the air and pushing his men to plug the gap. They run straight into a cloud of gas. Four men die before the rest get their masks on. But even shorthanded, the rest manage to repel the German advance. Then another whistle blows, and this time we go over the top, making our own doomed charge towards the enemy. World War I is a tough subject for a game. It's got none of the rah-rah patriotism of modern warfare, none of the counter-culture glam of Vietnam, none of the good-guys-bad-guys appeal of World War II. And perhaps worst of all, it's a meat grinder. It's gas and bolt-action rifles and barbed wire and mud and trenchfoot and young men sprinting trench to trench in thousands of crazed suicide runs. It's a nearly incomprehensible nightmare. Apologies for any weird smears in this screenshot. Just trying to protect my fellow players' usernames. 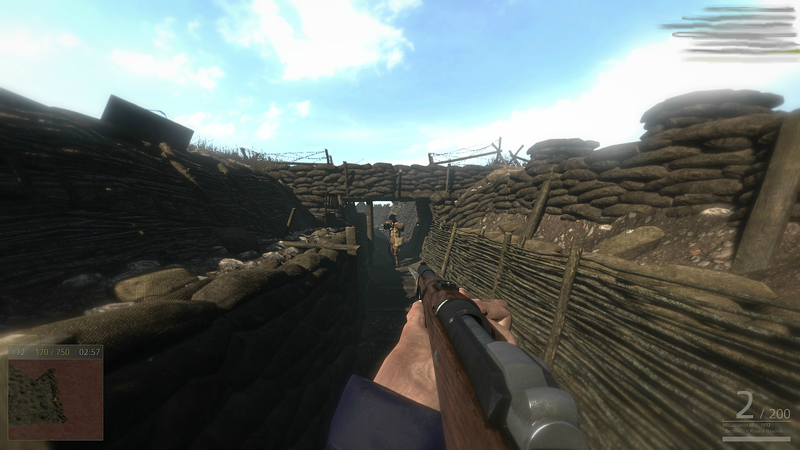 Verdun does what it can to distill the Great War into a multiplayer shooter. I'm a bit disappointed it's multiplayer only because I think World War I is great unexplored fodder for games, as evidenced by last year's incredible Valiant Hearts. But there's still quite a bit to like and appreciate about Verdun—not least the way it translates trench warfare into a game mechanic. 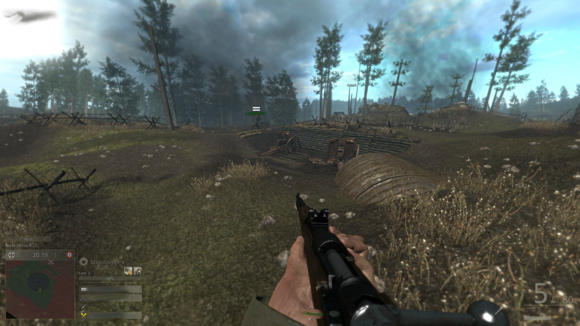 Verdun 's central game mode, Frontlines, draws heavily from Battlefield and games of that ilk, in that it's basically a point-capture mode. When a match starts, one team sits in its trench playing defense while the other sprints across the battlefield towards them, dodging gas and artillery fire and sniper shots. The goal is to make it across the entire no-man's-land (harder than it sounds) and capture the opponent's trench. Yeah, good luck making it across this without dying. You're on a time limit, though. Run out of time and you're forced to make a frantic retreat back to your own trench, defense becomes offense and vice versa, and then you're the one watching as men run screaming towards you across no-man's-land. Rinse and repeat. Just like World War I. If nothing else, Verdun's given me an excellent understanding of what a mess World War I was. The game doesn't have the best graphics, the best sound, the best character models, or what have you—and yet few games have so consistently stressed me out like Verdun. The first time I went over the top I said more than a few "Holy $@*&%s" out loud. It seems impossible you're going to cross this massive field of barbed wire, craters, and mud all while bullets crack overhead. Even more appropriate: Earlier today I had three matches in a row fought to a draw. (Matches are on a 30-minute time limit.) If that's not an appropriate outcome for a World War I game, I don't know what is. 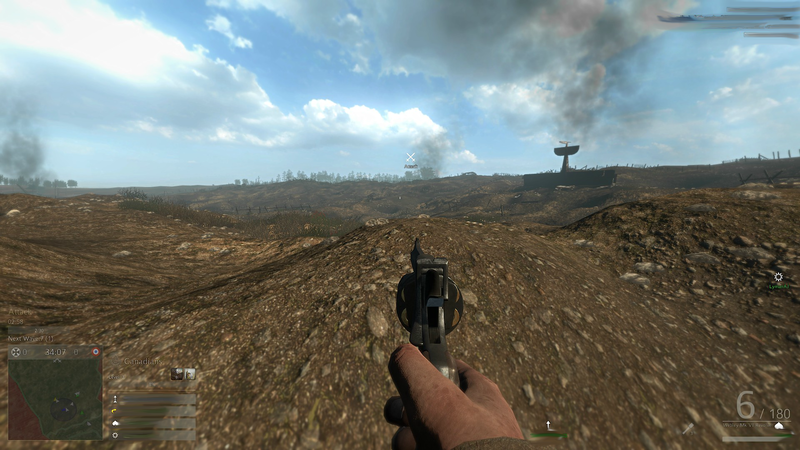 Now of course Verdun doesn't quite get across the true horror of World War I. 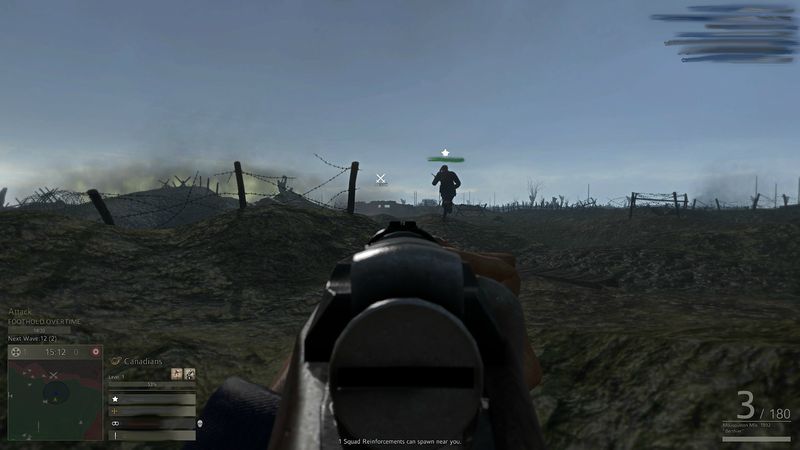 A chlorine gas attack in real life is a bit more horrific than your screen turning red, and with only 32 players per game it doesn't quite capture the massive scale of hundreds of men charging a trench. It's a decent simulacrum though, and the developers have done a fantastic job with other more game-y aspects. The squad system is particularly inspired. I mentioned matches are capped at 32 players. Those 32 are then split into teams—Entente and Central powers—and then further subdivided into four squads per team. It's not just an organizational thing like Battlefield, though. As a group, you'll choose what type of squad you want to be. For instance, on the Entente side you have the Chasseurs Alpins, the Canadians, the Tommies, and the Poilus. It's not just cosmetic. Each of these squad types has its own weapons, its own perks, and its own role to fill. For instance, the Tommies are focused on rifles. The Chasseurs Alpins are a recon unit, and the leader can call in a biplane to scout the enemy (like a World War I UAV). The Central Powers have their corresponding factions, although in that case they're drawn from three different German groups rather than different nationalities. It’s a genius way to make your squad feel more like an important choice and not just a throwaway thing you join up with to spawn on people. And if you stick with the same squad for multiple games, your squad eventually levels up and progresses through the war—you'll unlock new uniforms, new perks, et cetera. Unfortunately this progress is lost when you quit the game, but again it's a great touch to make you feel like you're part of a squad and that being part of that squad matters, which is something Battlefield has historically been bad at. In most games, finding a random crew of people you stick with and play multiple games with is the exception. In Verdun, it seems to be the rule. Most people seem to pick a squad and stick with it for the entire time they're online, which is impressive cultivated loyalty. Now, the downsides. Like a lot of niche multiplayer shooters, the Verdun community isn't huge. On the one hand, that's why the community is so great—it's small and full of people who really like the game. On the other, I worry about how long Verdun will be around. As the weeks roll on, it's possible we'll see servers start emptying out. It's hard to predict that sort of thing. All I can do is speak to right now, and right now the servers are fine. I've never waited more than a few seconds to get into a match, and although the community is small games always tend to fill up to the full roster of 32. The netcode could also use some work, however. I occasionally encountered issues with enemies teleporting as the netcode struggled to catch up, as well as some bouts of intermittent lag—though with the latter it was hard to tell whether it was a server issue or someone's ping. I did see someone with a ping of over 900 in my server at one point, which was…eye-opening. As a history buff, I've read a lot of books and watched a lot of films about World War I, but there's something different about experiencing that sort of event from the first-person perspective. Verdun isn't necessarily going to enthrall every shooter player (though I personally love the crack of its bolt-action arsenal), nor does it fully capture the horrors of World War I. I'm not sure any game could, at least with our current technology. But I really enjoy Verdun. With how important the Great War was, it's satisfying to see smaller developers (or small teams within larger developers, in the case of Valiant Hearts) getting the chance to explore this tragedy through more niche games. Combine that with an approach that actually makes sense for a shooter—Verdun's Frontlines mode really is sort of ingenious—and I think this is definitely one worth checking out, especially if you're already interested in the subject matter. 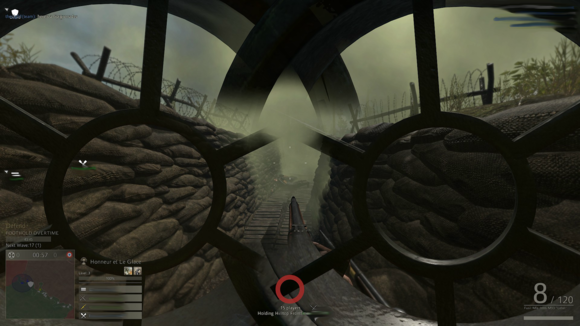 No game has ever captured the feel of trench-based warfare as well as Verdun.